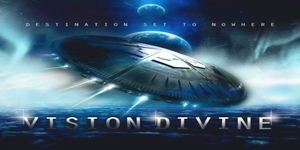 After the not so great last release from Vision Divine titled “9 Degrees West of the Moon”, where the band introduced the more high pitch vocals of Fabio Lione to the fold, the band attempts to piece thing back together on their newest offering “Destination Set To Nowhere”. The lost recipe on their last record seemed to have been the potent and versatile vocals of Michelle Luppi, who was the reinforcement behind such great releases the likes of “Stream of Consciousness” and the “The Perfect Machine”. With all respect to Lione as he’s a tremendous vocalist range wise, Luppi was out of the ballpark in distinct style and added a vigorous flare of energy to the band that set them apart from other Progressive/Power Metal acts. Fabio is more schooled in the traditional power metal school of rock, but this doesn’t mean that this effort is below standards like their last one. The music on “Destination Set To Nowhere” has the band reinforcing the more straight ahead melodic power metal approach from their last record and incorporating more keys and harder riffs to the fold. The album a concept of sorts is about a man journey through space as you could probably tell from the sci fi artwork. I’m compelled to tell you about influences from other sci fi led music and lyrics accustomed from bands like Pagan’s Mind for instance. The music however is another story. After a short interlude in Italian to open things up, the band launches it’s prowess on the song “The Dream Maker” featuring some interesting keyboard arrangements. 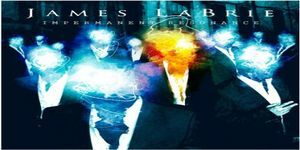 The hard edge and melodious chorus in “The Ark” gives way to a streamlined instrumental guitar solo. The haunting opening lines of “Mermaids from Their Moons” has Lione working it’s way with his up tempo shifting vocals throughout this explosive tune which also features an array of bombastic guitar and keyboards, I can see why he was asked to tour with Kamelot when their lead singer Khan left the band. The slower number of “Message to Home” portrays more of a soul approach in it’s root. The rest of the record compliments the first half pretty well as the band enchants the listener with more outpouring musical assault on guitars and drums. First few spins on this one and I still hear a more potent sound that the band has bred perhaps something they we’re going for judging from Lione’s past works in power metal symphonic bands like Rhapsody. You won’t be blown away with ground breaking mysticism as the sound here is typical of other bands in the genre, but it’s not say that is not an enjoyable offering as all the band members flourish with rampage and own-age of their respected instruments. I still feel some fans will never let go of Luppi’s style and his impact on the band on past records, but is a solid effort trying to find it’s way through it’s spacey concept. Chile is not very famous for its Metal acts, some Metalheads possibly could remember the band Six Magics that more or less famous over the world. Fireland is another band from Chile that was founded in 2006 by guitarist/singer Rafael Castillo with support of producer Franco Lama. After some years the band includes Rafael Castillo (Lead vocal and guitar), Matias Vidal (Lead guitar), Gonzalo Gamio (Drums) and Claudio Gonzalez (Bass). 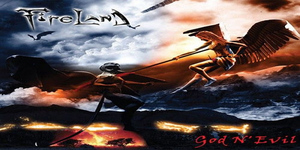 By the end of 2010 Fireland had recorded and released its debut work “God ‘n’ Evil”. The album received positive critics but it was not widely known due to independent release. Fortunately in October 2014 “God ‘n’ Evil” was officially released by Power Prog label as digital album.